How many times have you stopped to focus on your breathing only to find that you are taking very short breaths or maybe even holding your breath in times of stress? This is completely counter to what your body needs. According to Breathing.com, breathing provides 99% of our energy. Now imagine that you could only take that essential breath through one of those tiny plastic coffee stir straws. What made me think so much about breathing? Well it happened quite by accident one day while cruising on my longboard. So there I was paddling around in small surf one Saturday morning in Laguna Beach. The water was freezing cold. For some reason the temperature dropped into the 50’s in the middle of July. Another day of June Gloom (which never seems to come in June anymore), and I was pretty confident that I had the surf all to myself. Twenty minutes later, tents are popping up. Then dozens of kids show up with their boards, parents too, but the most surprising of all were the professional surfers. Now we know these guys never get up at 8am to ride 1-2 foot surf at Thalia Street, especially when the water is cold. So what gives? As it turns out, they were all here in support of the Mauli Ola Foundation. Sure I had heard the name before, and like everyone else, I called it The Maui Ola. Close enough, right? No, Mauli Ola means “breath of life” in Hawaiian. Pretty cool, huh? These guys are all about helping people overcome the challenges of living with Cystic Fibrosis, a disease that affects the respiratory system. The Mauli Ola Founders discovered that ocean activity is a treatment for Cystic Fibrosis. Wow, how cool is that? I always felt that surfing was healing, but this takes it to a whole new level. For most of us, coughing is enough to clear our lungs, but for people with cystic fibrosis, coughing is not enough. Lung airway surfaces in CF patients are dry, which makes the mucus harder and stickier. When patients inhale saltwater, it causes their lungs to re-hydrate by adding a layer of water to the airway surface. The ocean water acts as a lubricant, which makes it easier to clear the mucus. I decided to stay right in the middle of the group as the Pro surf instructors each paddled out with one kid. This was more like a big family reunion than a surf instruction. Oh, yeah, there was a lot of talk about the cold water, but I never heard anyone complain. Did I mention it was in the 50’s? These young surfers were having too much fun and did not want to get out of the Ocean. I could sense the camaraderie and friendship among every member of this group. I immediately wanted to know more about these kids and find out how surfing has changed their lives. When I got back on the beach I decided to spend a little time observing this event while I shook the water out of my ears. There was this one big dude in particular with a bullhorn yelling out commentary about the kids while they surfed. He also cracked the mandatory jokes about the surf pros/instructors. I introduced myself to the ring leader, Bobby Serna. I decided to dig a little deeper and chat with some of the other folks attending the Surf event. The more I talked to these people, the more I realized that an impressive number of Pro surfers and other great athletes have already come forward to support this cause. But everyone was quick to remind me that the real stars are the kids. That’s where the inspiration comes from. The leaders of the Foundation, The Surf Pros, the parents and volunteers are all inspired by the kids. I was also introduced to an extremely stoked young surfer named Caleb Remington. Caleb is 20 years old. He moved out to California from Chicago soon after he discovered that that surfing was going to help him breathe better and strengthen his body at the same time. By strengthening his body, Caleb will have better results when battling respiratory infections. Even though Mauli Ola has attracted big names like Kelly Slater and Rob Machado, the kids I spoke with gave all the credit to people Like Mauli Ola Team Manager Dougie Tanaka Jr. who has taken Caleb under his wing, and Laguna Beach local, Steven “Sli Dawg” Chew who apparently taught Taylor some essential surfer slang, as well as riding skills. “Brah” is her new favorite term according to her Dad. Thanks Sli Dawg. I kept hearing words like family and support. Everyone I met said that they would do whatever it takes to get the word out about Mauli Ola. Not one complaint. These kids do not have it easy. Caleb was hospitalized three times last year, but he’s completely stoked. He’s breathing better, he’s eating better and he’s getting stronger. Hopefully we will all get the chance to meet and surf with such an inspiring group of people. In the meantime, enjoy your surfing, and above all enjoy your breathing. Thank you SO MUCH for bringing awareness and attention to Cystic Fibrosis! I am from Corpus Christi, TX and grew up near a beach. My son is 4 and has CF. I plan to take him to the event in Port Aransas, Texas this August. He’s gonna be stoked!!! What a beautifully inspired story of these amazing children,their families and Mauli Ola. 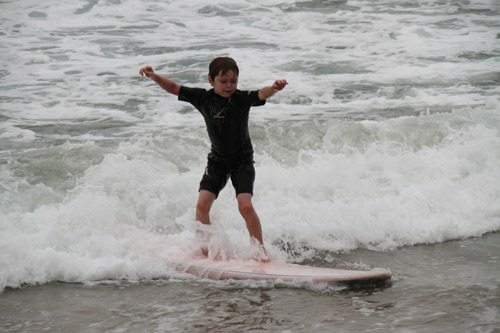 This surfing event is a wonderful way to help the kids and spread awarness of which I had none. Good luck to all those involved. Thanks Paulette. It was a fantastic experience for me to get to know these great kids and their wonderfully supportive parents. Thank you for this awesome piece!! The first step to a cure for CF is awareness and we thank you for sharing our story. Mauli Ola is currently traveling across the U.S. to help bring surfing to CF patients in other states! We wish them well. Mauli Ola rocks! !